Description: Aspen is a fast growing tree. It grows up to 100 feet in height. The lower part of the trunk of grown out trees is grey and becomes almost white on the upper part. The broadly ovate leaves are on average 1 3/4 inch long and wide. The leaf stalks are flattened and result in the fluttering of the leaves at the slightest wind. Therefore this nice tree is also called quaking aspen. The male and female flowers are not found on the same tree. 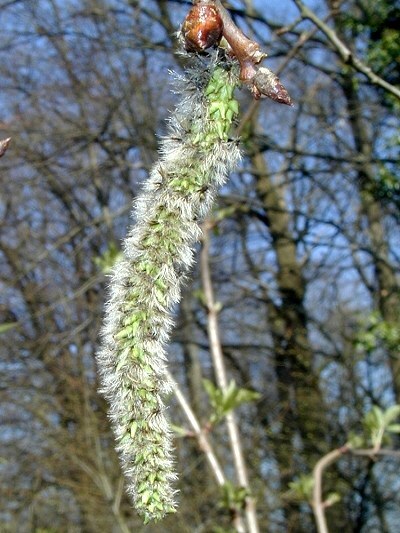 Male catkins are about 2 inches (5 cm) long, while the female, or pistillate, catkins are up to 4 inches (10 cm) in length. The fruit ripens in late spring or early summer, before the full expansion of the leaves, and contains tiny, rounded seeds.